Turn dad's favorite breakfast into an impressive meal for family day! With creativity and the right tools, whip up pork barbeque yang chow for dad and the rest of the fam! This is dad's favorite comfort food selections in one plate! 1. Wash and prepare all the ingredients first. 2. In a bowl, mix the pork, garlic, sugar, pepper and barbeque marinade. 3. Using the Chefs Classics Daisy Plus Fry pan, pan fry the barbecue until ready. Set aside. 4. 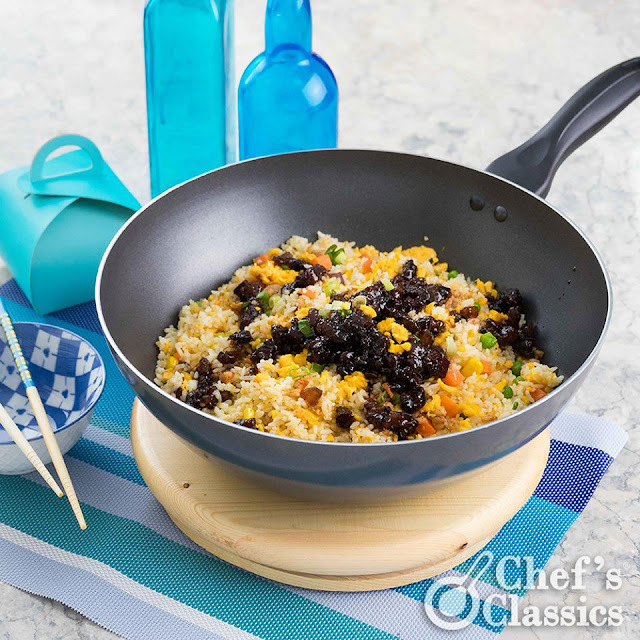 For the Yang chow rice, use Chef s Classics Daisy Wok and saute the onion, garlic, chorizo sausage, shrimp and carrots. 6. Lastly, add the green peas, onion leeks and scrambled eggs. Season it with salt and pepper. Mix the pork barbeque to the Yang chow rice. Bon apetit!